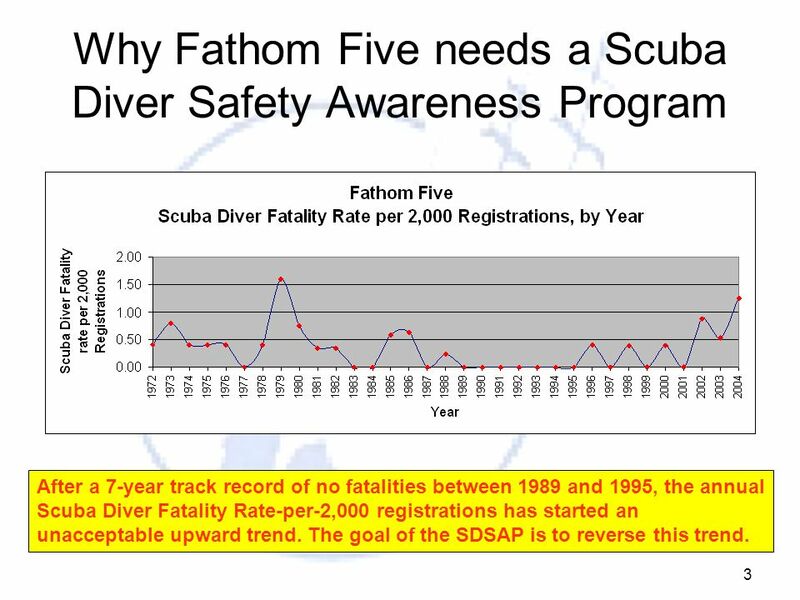 After a 7-year track record of no fatalities between 1989 and 1995, the annual Scuba Diver Fatality Rate-per-2,000 registrations has started an unacceptable upward trend. The goal of the SDSAP is to reverse this trend. 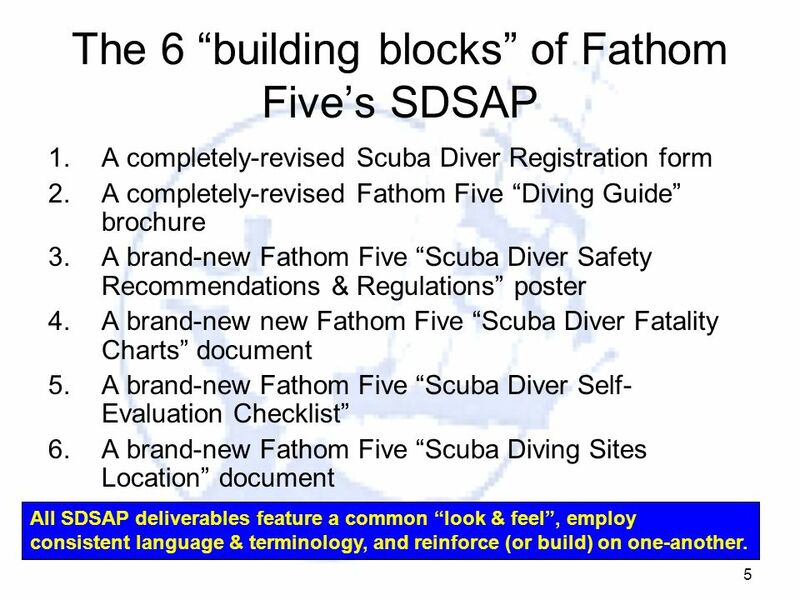 A completely-revised Scuba Diver Registration form A completely-revised Fathom Five “Diving Guide” brochure A brand-new Fathom Five “Scuba Diver Safety Recommendations & Regulations” poster A brand-new new Fathom Five “Scuba Diver Fatality Charts” document A brand-new Fathom Five “Scuba Diver Self-Evaluation Checklist” A brand-new Fathom Five “Scuba Diving Sites Location” document All SDSAP deliverables feature a common “look & feel”, employ consistent language & terminology, and reinforce (or build) on one-another. 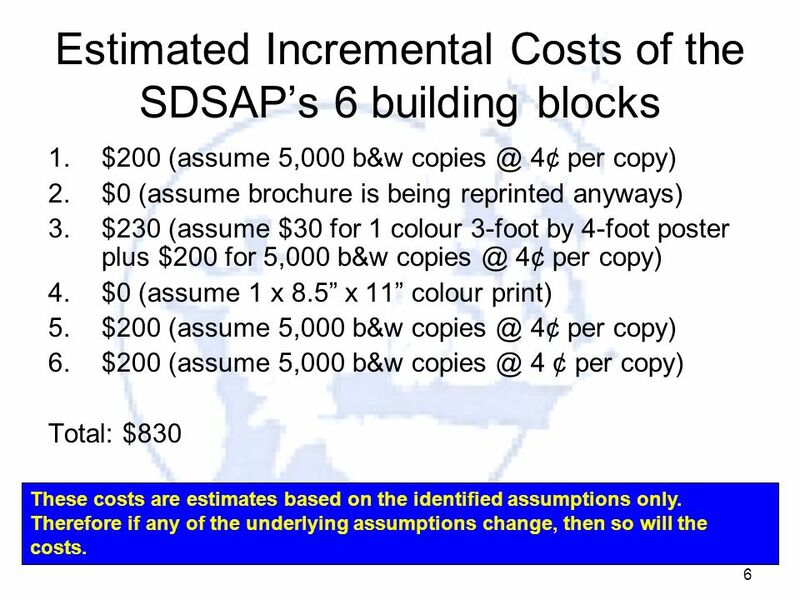 $200 (assume 5,000 b&w 4¢ per copy) $0 (assume brochure is being reprinted anyways) $230 (assume $30 for 1 colour 3-foot by 4-foot poster plus $200 for 5,000 b&w 4¢ per copy) $0 (assume 1 x 8.5” x 11” colour print) $200 (assume 5,000 b&w 4 ¢ per copy) Total: $830 These costs are estimates based on the identified assumptions only. Therefore if any of the underlying assumptions change, then so will the costs. 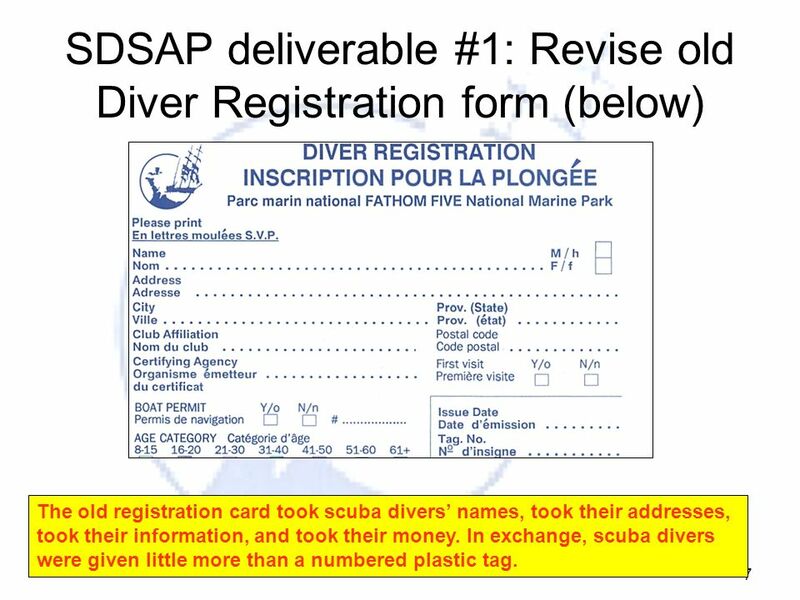 The old registration card took scuba divers’ names, took their addresses, took their information, and took their money. 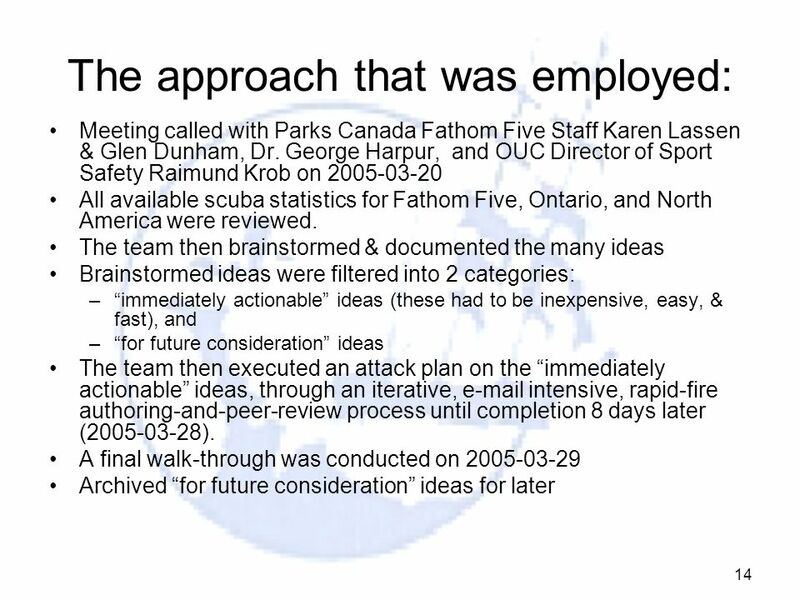 In exchange, scuba divers were given little more than a numbered plastic tag. 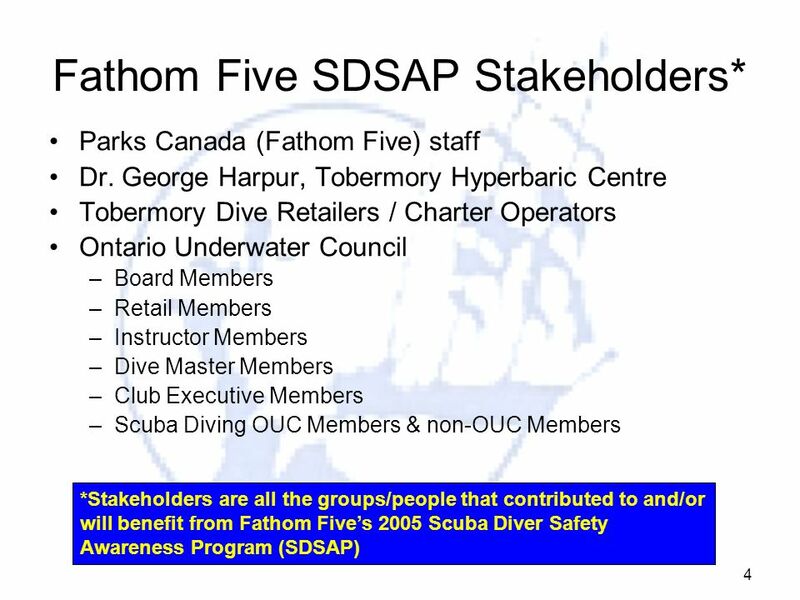 The new (legal-sized) Diver Registration form gives valuable information to scuba divers on how to safely enjoy their visit to Fathom Five. 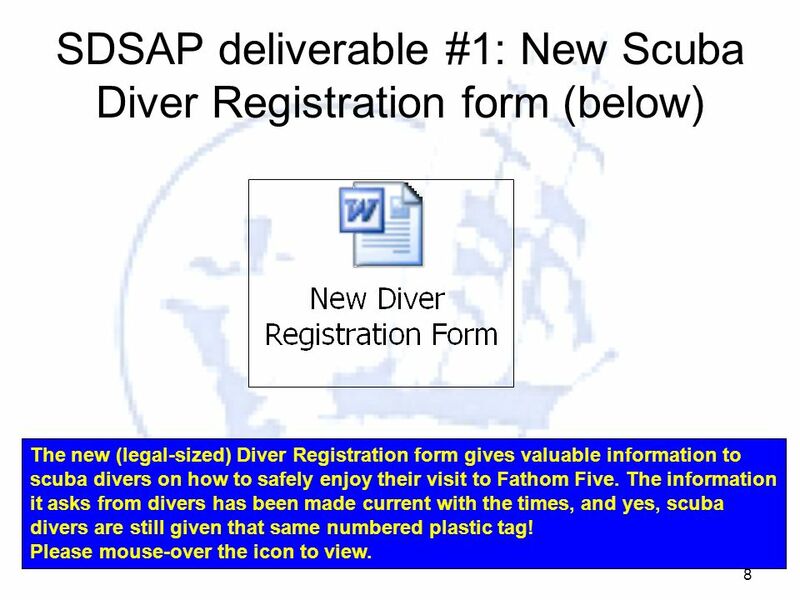 The information it asks from divers has been made current with the times, and yes, scuba divers are still given that same numbered plastic tag! Please mouse-over the icon to view. 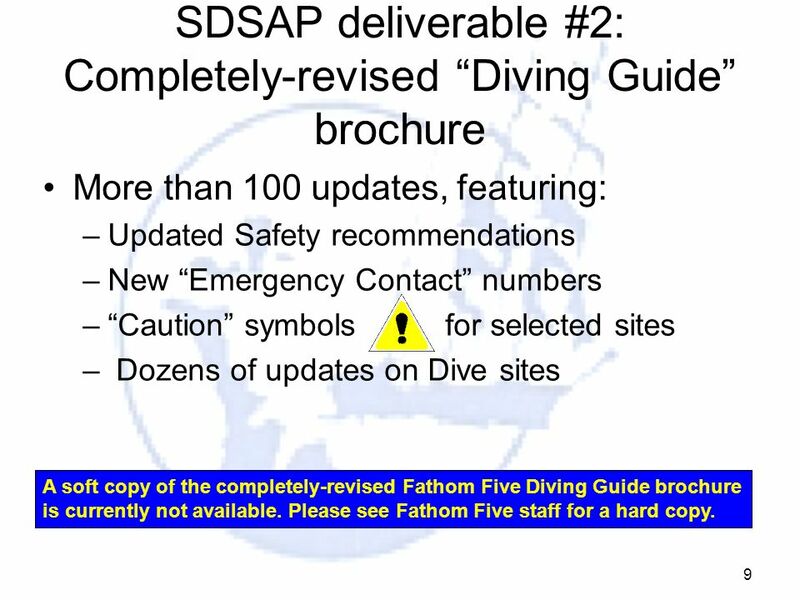 More than 100 updates, featuring: Updated Safety recommendations New “Emergency Contact” numbers “Caution” symbols for selected sites Dozens of updates on Dive sites A soft copy of the completely-revised Fathom Five Diving Guide brochure is currently not available. Please see Fathom Five staff for a hard copy. 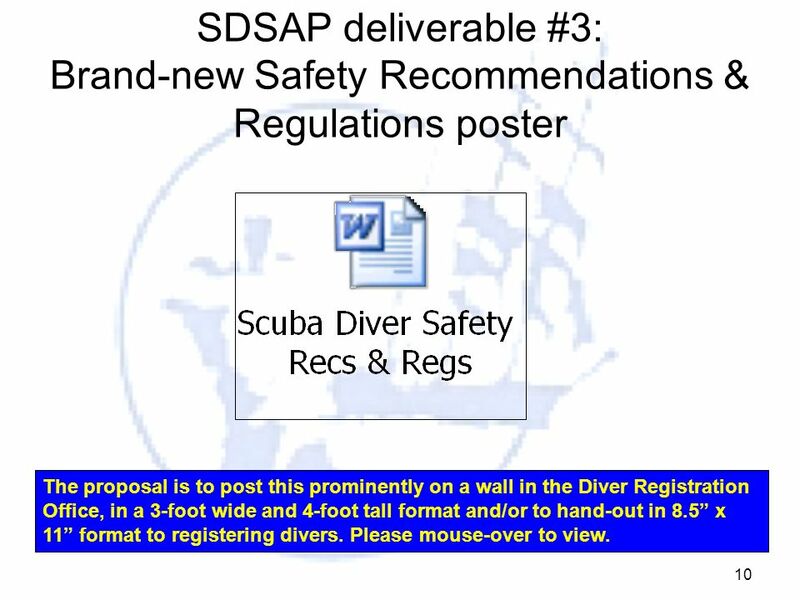 The proposal is to post this prominently on a wall in the Diver Registration Office, in a 3-foot wide and 4-foot tall format and/or to hand-out in 8.5” x 11” format to registering divers. Please mouse-over to view. The proposal is to post this immediately underneath the Safety Recommendations and Regulations poster in an 8.5” x 11” format. Please mouse-over to view. 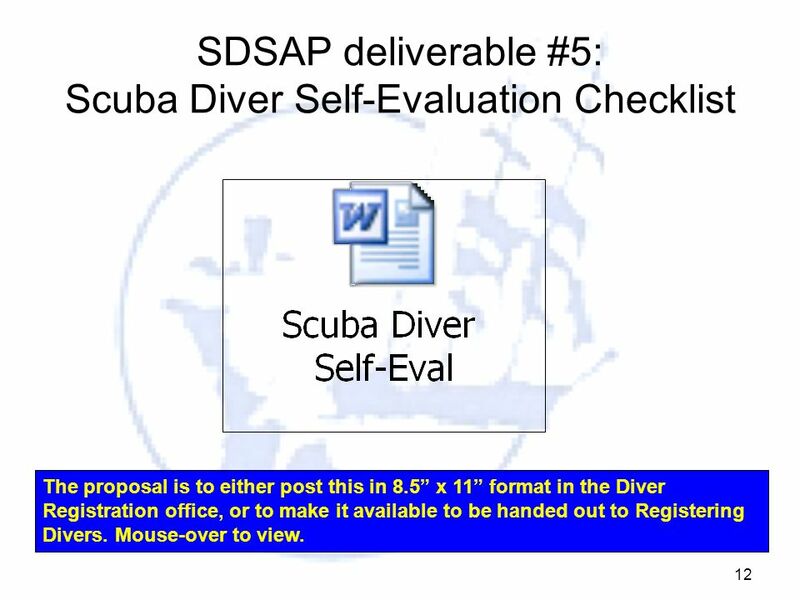 The proposal is to either post this in 8.5” x 11” format in the Diver Registration office, or to make it available to be handed out to Registering Divers. Mouse-over to view. 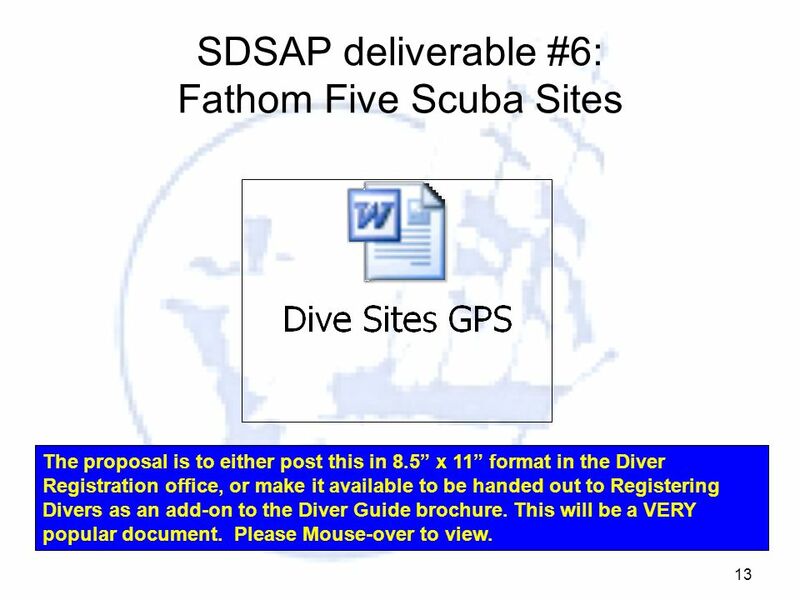 The proposal is to either post this in 8.5” x 11” format in the Diver Registration office, or make it available to be handed out to Registering Divers as an add-on to the Diver Guide brochure. 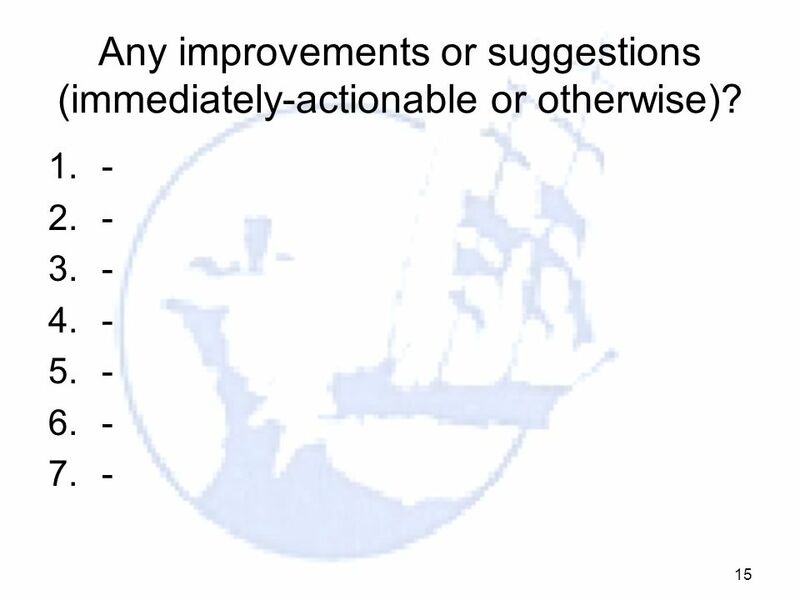 This will be a VERY popular document. Please Mouse-over to view. 15 Any improvements or suggestions (immediately-actionable or otherwise)? 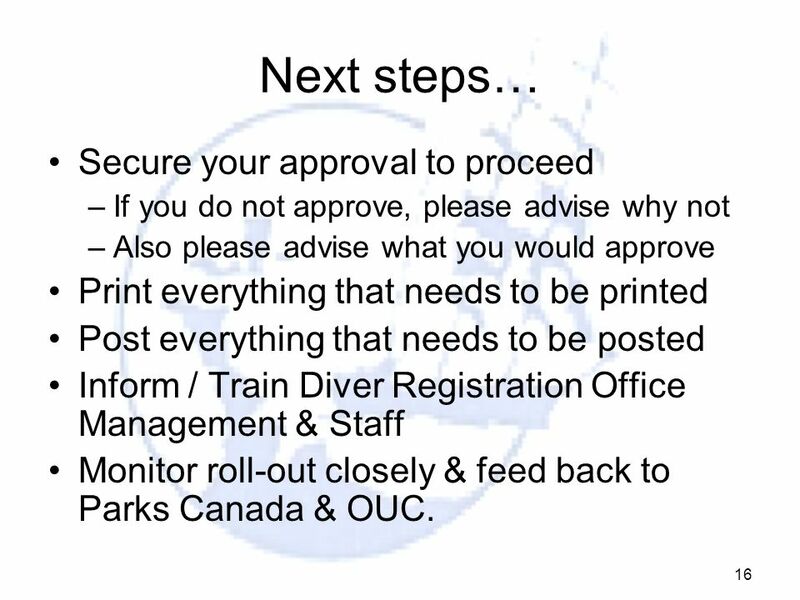 If you do not approve, please advise why not Also please advise what you would approve Print everything that needs to be printed Post everything that needs to be posted Inform / Train Diver Registration Office Management & Staff Monitor roll-out closely & feed back to Parks Canada & OUC. 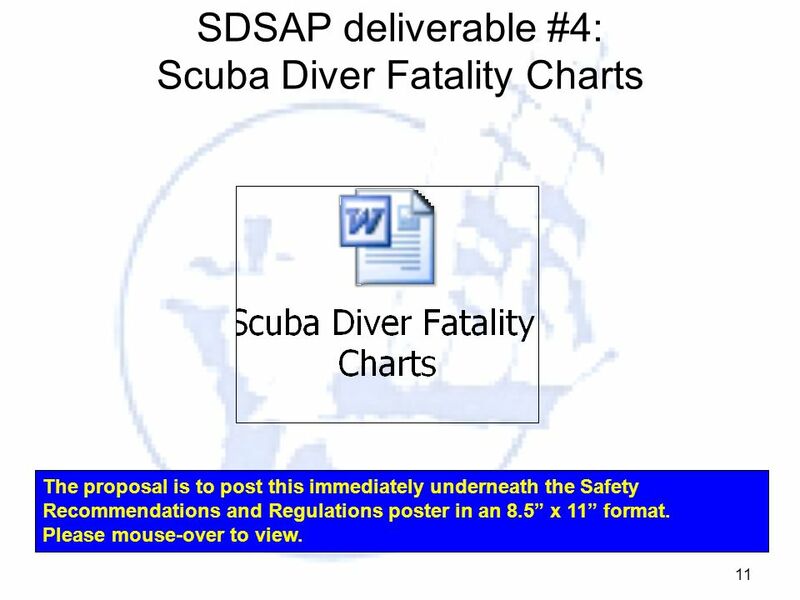 1000* Unsafe Acts 100* Minor Injuries 10* Major Injuries 1* Fatality *Note: numbers shown are not representative of Scuba Diving and are shown for illustrative (theoretical) purposes only. Every 1000* unsafe acts will drive 100* minor injuries Every 100* minor injuries will drive 10* major injuries Every 10* major injuries will drive 1* fatality. 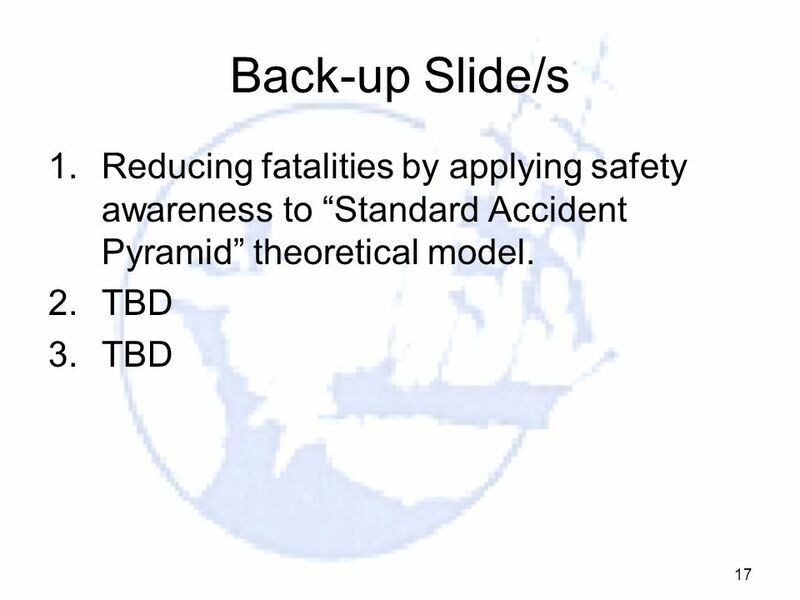 To reduce fatalities at the top of the pyramid, reduce the numbers of unsafe acts at the bottom of the pyramid! 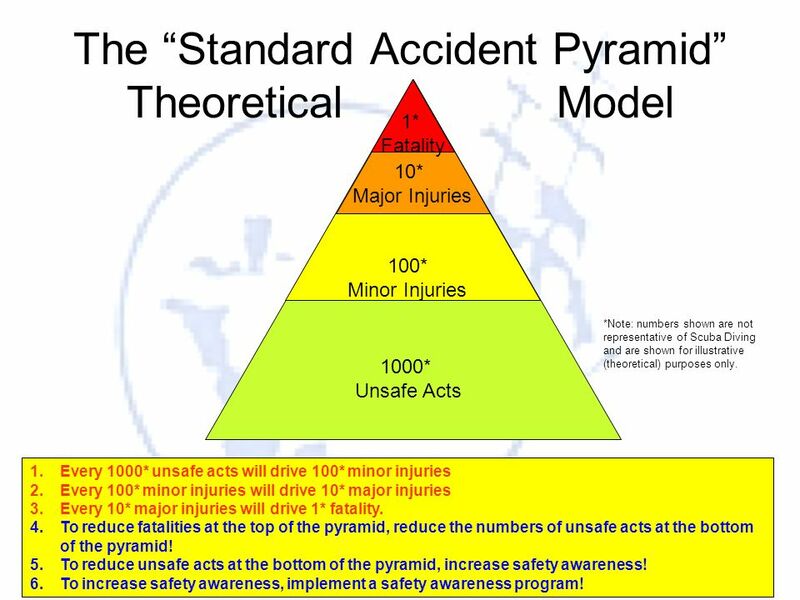 To reduce unsafe acts at the bottom of the pyramid, increase safety awareness! 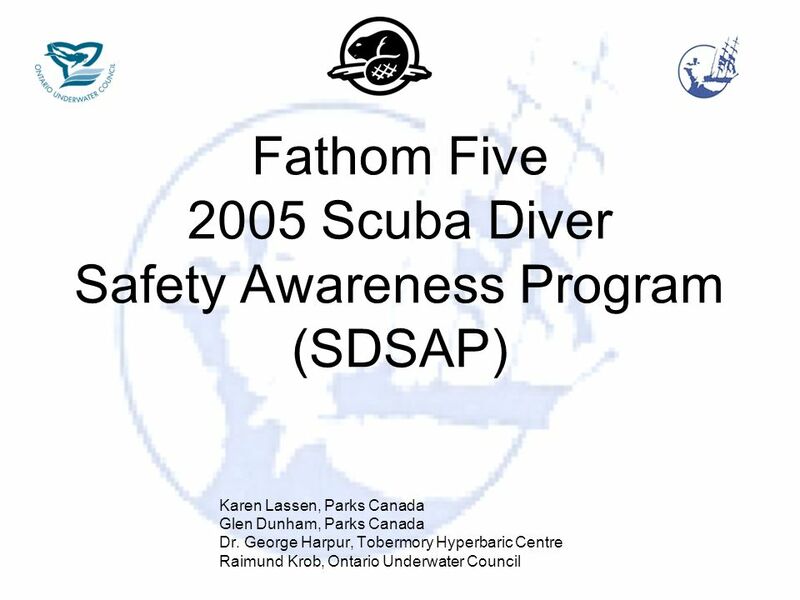 To increase safety awareness, implement a safety awareness program! 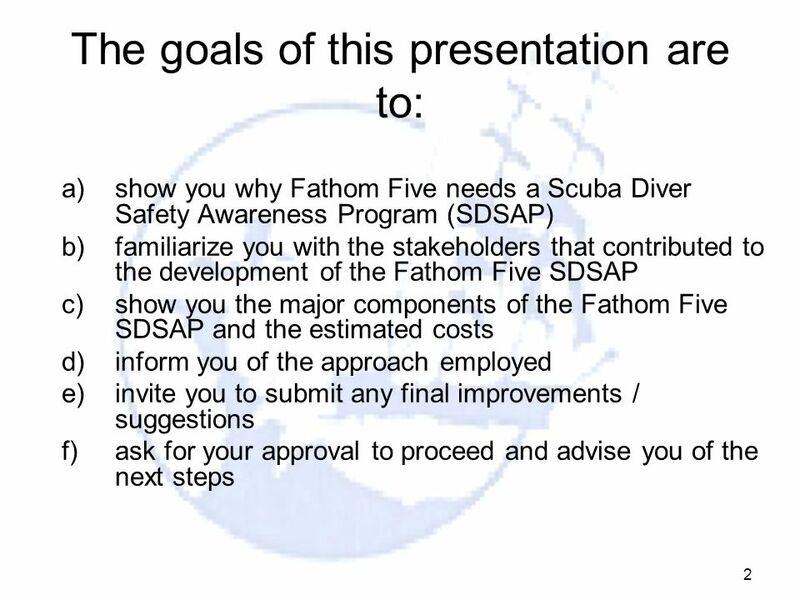 Download ppt "Fathom Five 2005 Scuba Diver Safety Awareness Program (SDSAP)"
Peer Review and Development Groups Support for Excellence Programme - Huddle.